HMH Designs: Make It Rain...Barrels! My movement is green...is yours? Water harvesting is getting bigger and bigger everyday. Rain barrels are a great way to reuse water. Save some money when you need to water your lawn, flowers or gardens, wash your car, and even save on your storm water bill as discussed in this post. Use the water you saved when time of drought happens (and you know it will). Rain barrels are relatively easy to make, but finding the barrel can be a challenge. 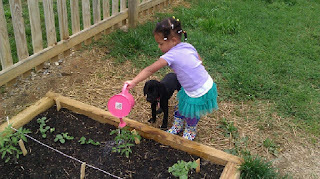 I have seen rain barrels already assembled at places like Whole Foods and even Lowe's for upwards of $100. So we were thrilled when we found barrels at the Manchester Earth Day festival for only $15, it even came with a 6" hole in the top with a tight mesh mosquito screen to keep any standing-water-lovin' bugs out and to allow all the rain water in. All we had to do was add a faucet (hose bib) and an overflow valve. The first step was drilling the hole for the faucet. You want to drill the hole as low as possible (since water below the hole won't flow out). We drilled the hole with a regular drill with a 3/4" hole-cutting attachment that we purchased from Lowe's. Then we used our faucet to thread the plastic edges of the hole. We did this by screwing it all the way into our newly made hole. Once the faucet was screwed in we added a plastic washer (which we had to heat up) to add to the backside of the faucet and then added a 1/2" conduit lock nut (also purchased a Lowe's). Next you have the option of repeating this process to add an overflow valve which allows you to connect to other barrels or to have an additional garden hose attached that is already inside your garden, flower beds or even your irrigation system to water it when the barrel is completely filled and has no where else to go. This prevents the water from just overflowing, spilling the excess water over the top. Then we just had to adjust the height of our downspout so it would spill into the top of the barrel. We detached the elbow at the bottom of the spout and used a box cutter to cut the downspout once we figured out our desired height. In the process of cutting the downspout the razor inside the box cutter broke, but my husband showed me where the extras are hidden. With the gutter cut to the right height we just reattached the existing end spout and slid the barrel into place underneath it. Now...make it rain! Since we installed the barrels we've had some rain. 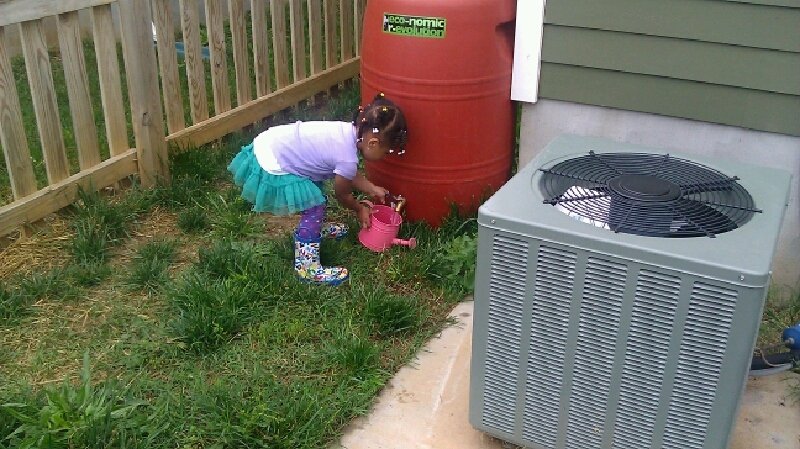 Look at my princess putting the barrels to use. Pretty easy, eh? Do you guys have rain barrels? Any tips for us newbies when it comes to collecting rain water? very good idea,thank you for it sure to try it. Thanks! I would love for you to share how yours turn out! Thanks Allison for featuring my project! I will see you at next week's Catch a Glimpse party! What an excellent idea! Love it! Thanks so much for sharing at Thursday's Temptation. That is a fantastic idea. It is great your Princess is learing early on how to use rain water. THis is so awesome! What a great tutorial! We would LOVE for you to stop over and link this post up and any others in our Crafty Showcase. Our showcase runs from Sat-Thur and then on Friday our designers pick their favorite to be featured.